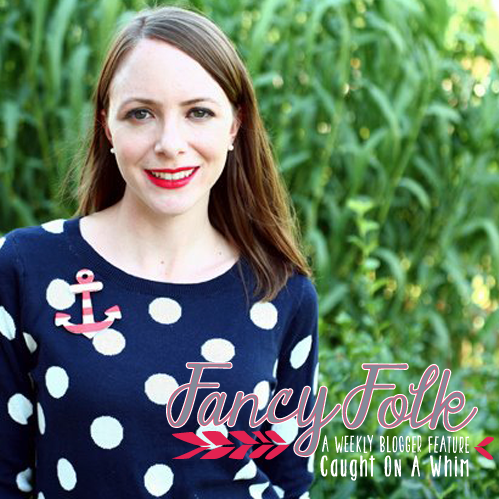 so I'm especially excited that she is this week's fancy folk! Erica is a snappy crafter with lots of fantastic DIY's on her blog. What is on your 2013 agenda? Lots of crafting for sure! I've got tons of crafty projects spinning around in my head that I can't wait to create. I also want to do some traveling. Going to the beach is mandatory this year. It's been too long since I've had sea salt in my hair. If you were a cat who would you follow all day in the hope that they would look after you? Meredith of One Sheepish Girl is a pretty cool cat herself. She is so genuine and creative. I always find inspiration in her blog posts. Maybe she'll take me in?? Sewing! I just got a sewing machine for Christmas and am teaching myself to sew. I can't wait to start making myself custom clothing. swing by her blog and say hello! Definitely going to go and check out her blog! I love Erica's blog too :). I can't wait to see her new crafty projects :). Love Erica's blog! She is so creative and makes such pretty crafts. Hope you both have a wonderful day!